Well...what an awesome Friday, Saturday and Sunday it has been!a blessed, fun, hard running time! So, from the start... Friday saw my middle weigh in for my 12week challenge. I had a goal and fell only 200g short! So close!!! Ha! I can't complain though, 8kg in 7weeks!! Pretty darn stoked with that!hopefully, anyone at saw my photo on facebook on Friday would agree that my hard work is paying off! YES! I have some personal goals for the next phase of the journey too, so stay tuned! Friday night we drove down to the Coast to stay with our awesome friend Katie. We woke Saturday morning and had a coffee out before heading to Redcliffe to meet up with Lori, Chris and kids (Lori who I have met at ultras and written a previous blog about) and Dan and his kids (who I ran Cooks tour with)for a long planned lunch. Lori, Chris and Dan brought some beautiful food (apart from the meat! HA! ), and apart from the ridiculous wind it was an awesome day out! Loads of laughs, fun, food and tales. A truly blessed time with new, and I'm sure long lasting, life time friends! Andy and I keepin it real. We then returned back to Katies for a quiet night in before race day Sunday. We woke to a pretty cool day but beautiful running conditions. We headed to the start and with some last minute instructions we were off! 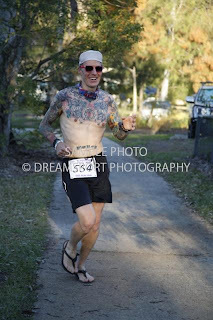 I decided this to be my first event 'Anton-esk' and ran the whole thing shirtless! It was a bit nipply to start with but lovely once we got going! Just nice to be in the sunshine after training all winter in the cold and dark! 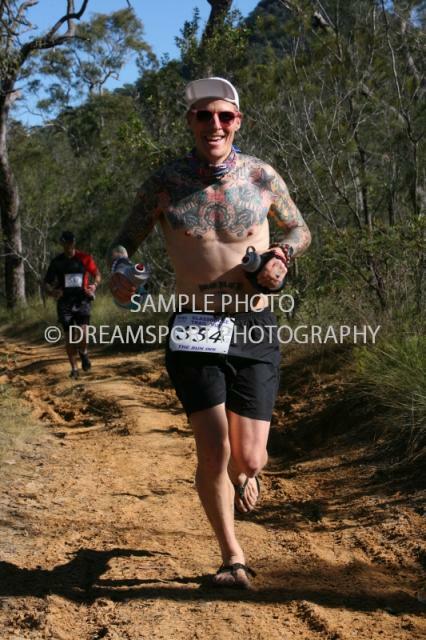 We started with a climb up Mt Beerburrum. For those who don't know, it is only about 1.5km long but is at a 45 degree climb!!! No that is not a typo, it is STEEP! I wish I lived nearby cause I would be going up and down that sucker in my training program at least once a week. After going up we started the running and I started the day with my mate Andy from a small place just outside Toowoomba. We had a great catch up (I met him through the North Face run in 2010) and cruised along nicely. We hiked the hills hard and had a good time. 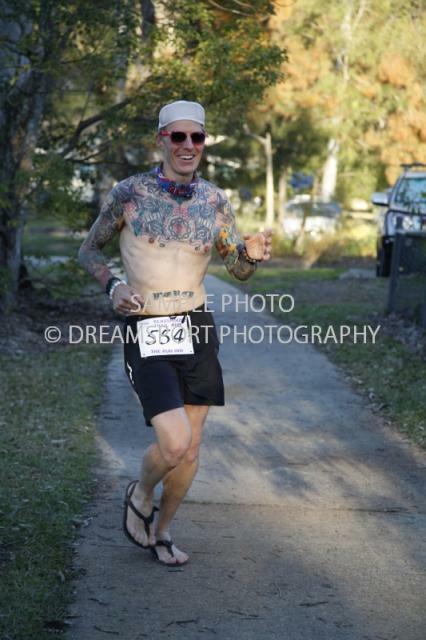 I reckon it took me about 15k to get my 'running legs' back after Beerburrum but they came eventually. The first loop (a little longer) was 27.5km. We got back to the school without too much drama and was good to have a laugh and see the girls. We weighed in (only a little down), restocked out kit and headed off again. I was feeling pretty good so got into it. I reached the first aid station on the way back and after leaving here came to a junction. I looked at the signage on the tree and thought I had to do a 2k loop extra to make up some distance...after a little, I realizes I was wrong! Silly boy! 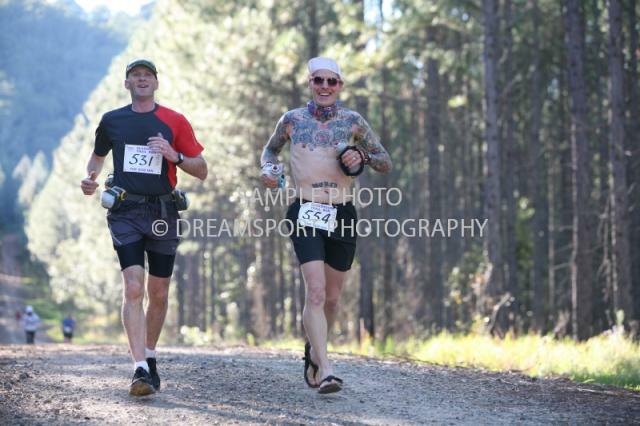 I then got back on track, ran hard and caught Andy back up (he passed me after my detour) at the next checkpoint. I continued to get into it and did some hard running. It was really turning out to be my day (apart from my extra 2k detour!) and I ran hard. I was bombing the down hills hard, power hiking the uphills angry...like a man possessed and running every opportunity I could! After the last checkpoint it was funny, I was dreaming I was in Unbreakable (an ultra movie about The Western States Endurance Run, check you tube) and leading the race. I felt like I was running so smooth and free it was awesome. Beautiful trail and beautiful fun! I came to the finish and although I knew my legs were pretty belted, was soo happy with my efforts! I finished the race in 5hrs 31min! My previous best at this event was 6hr 18min, and that was 2k less!!! Stoked! A super event and a just reward for all my hard training and discipline I have been working so hard on! At the end I did a snappy interview for a raw food/minimal running website. The writer, Russell was filming at one of the checkpoints and has compiled a cool little video on his website. 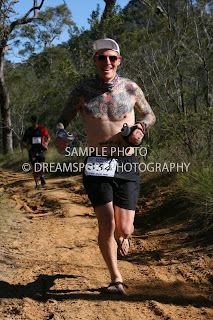 Check it out here http://www.watzzupsport.com/1131/minimalist-footwear-trail-running/ thanks Russell. I also wanna say a big thanks to Chris at the Mower Doctor Bundy for sponsoring my first event. Good times!! Well there you have it friends! A cool, awesome weekend! Can't wait for the challenges ahead and to share them all with you. There are many things in the pipeline as always so stay tuned! I hope and pray your going awesomely good and your making the most of every day! Keep smiling, loving life...until next time...RUN ON!! !